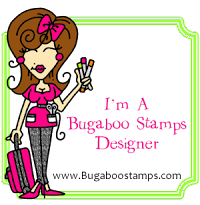 It's another great challenge at Sweet Stamps . Our challenge theme for this week is to Use a Die . I taped the die to the back of the foil with removable tape, then used a stump to trace- don't be afraid to press hard! You can use the stylus tool to show the fine areas of the die- like the owls eye and body too- which I did at the end. 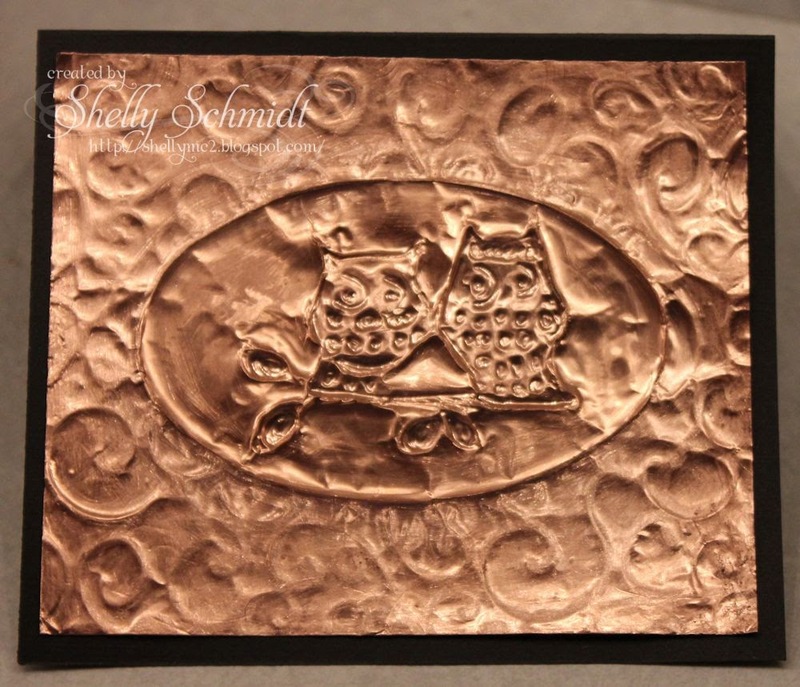 Next, I placed the foil onto the embossing folder (ridge side up) and rubbed the stump over it. I did not remove the backing before attaching to the card- so it would be a bit sturdier. I sanded the foil before attaching it. On colored foil, the base with show up just like sanding the Coordinations cardstock shows a core color. Ok- I also had some fun with dies and my Art Journal cover. I made something REALLY different for me. 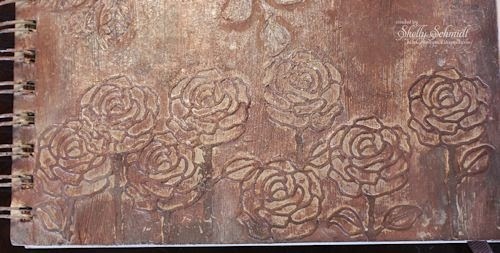 For the April/May Technique Junkies newsletter, we learned a technique for cards (inspired by Art Journals) called Textured Monochromes. 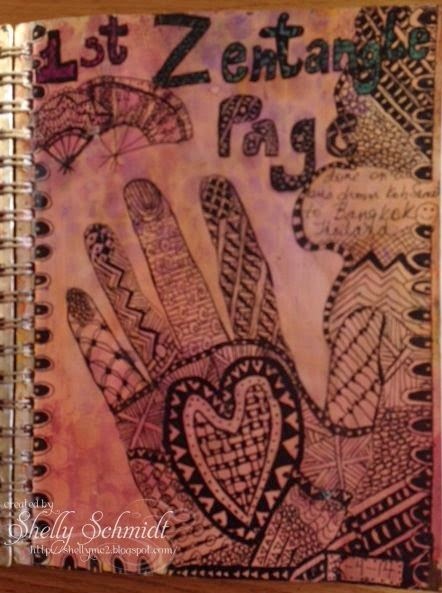 I thought I would decorate the cover of my Art Journal....so here goes! First, I painted the cover with Gesso, then with a light brown acrylic paint color. 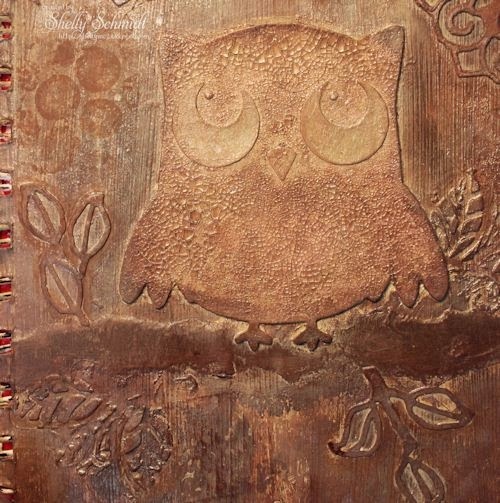 I picked brown as that is the color I figured the owl should be...... Next I cut the owl out of plain grungeboard. I attached it to the cover with gel medium. I ripped a piece of cardstock and made it the branch under the owl- attached it with Gel medium. I cut out the Mini Medallion die, and added modeling paste through it top left and again- just out of the picture on the right. I added a stencil with moon shapes- thinking it looked similar to the owls eyes. On the far bottom, I added numerous roses- I cut off and saved some of the leaves from the Roses. On the leaves- upper Rt and lower Lt, I used modeling paste thru leaves, and the other two and leaves from the roses pieced together. I added more color in layers, added some crackle paint and some sparkle spritz (Fairy Dust Creative Inspiration paint mixed with water). Once I did that- forget taking a picture of this- the sheen changes the colors a tad....... 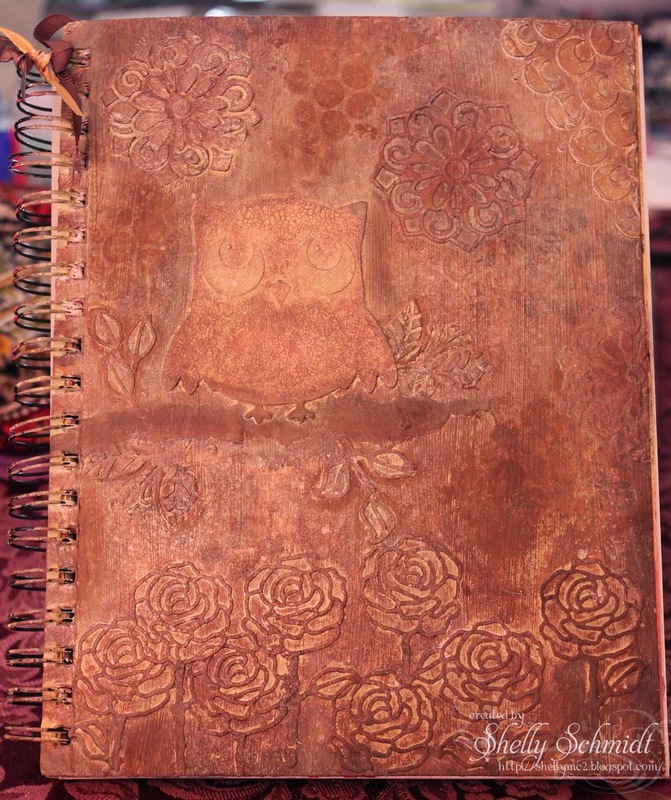 I added Brownie and Latte Shades die ink sponged on around the edges for a finishing touch. I also mixed some Brownie ink with Gesso, and used bubble wrap for more interest. I added a few ribbons to the edge- and will add more later- I am messy, so do not want to get paint and gesso all over it while playing. 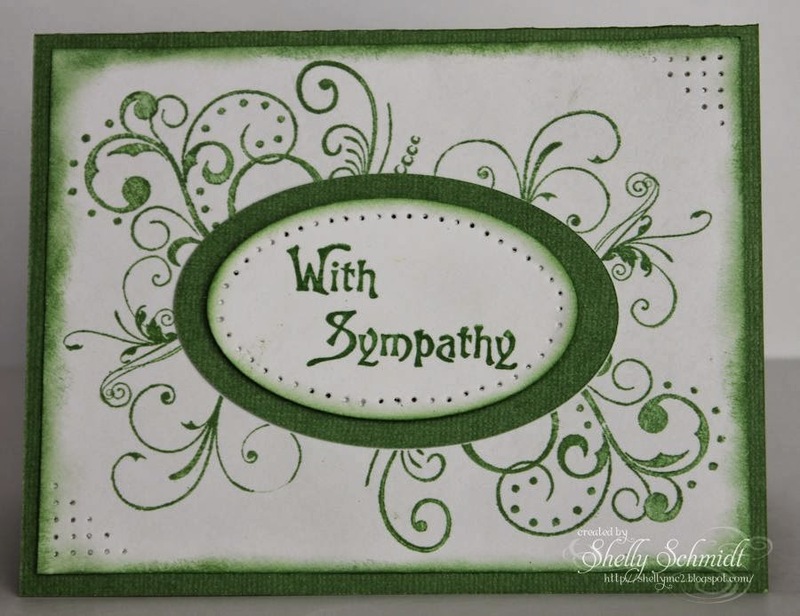 Here is a direct link to the Monthly Challenge as well- 3/15- 4/14 Inking Stamps with Markers . You have a chance to WIN- winners drawn by Random.org. 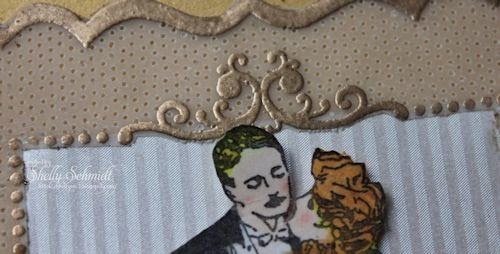 Here is a pretty background technique for a card using- Washi tape. This was made for the Feb/March Technique Junkies Newsletter and it was fun to actually use some of my Washi Tape up! 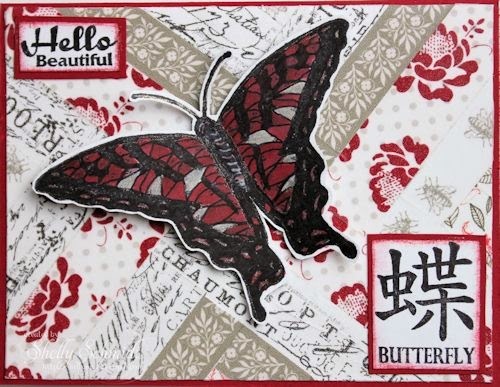 I love this beautiful butterfly and the sentiment is perfect my my daughter(s), I call them both Beautiful (or Petunia- hahaha) and the Kanji is perfect for Katie! The stamps are by Mark's Finest Papers. OK- bet you read that title thinking- what the heck is she up to??? Well, surprise- it is a Technique Junkies technique from the Feb/March newsletter! I stamped on Soft Suede and colored the image with Twinkling H2O's. Ohhhhhhh- I do not get these out enough! The image, black Kanji text and sentiment are from Marks Finest Papers. The BG stamp in white is from Technique Junkies. 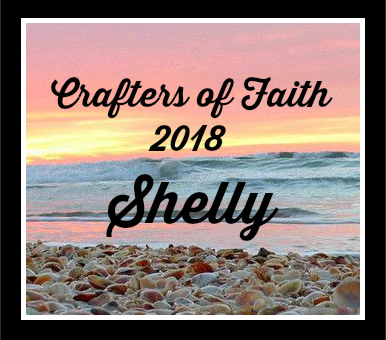 I am recovering with a bout of the flu this week- my husband had it first and since we share almost everything....... (Well, he stays out of my craft room, and just about everything in the garage- is his ). I had to make this fun card for my sister- she is a Patent attorney but her undergrad was in Physics : ) All images are from Technique Junkies Stamps. I used SU Choc Chip and Cherry Cobbler cardstock and ink. I also added a touch of shimmer using a Sakura Gelly Roll pen. 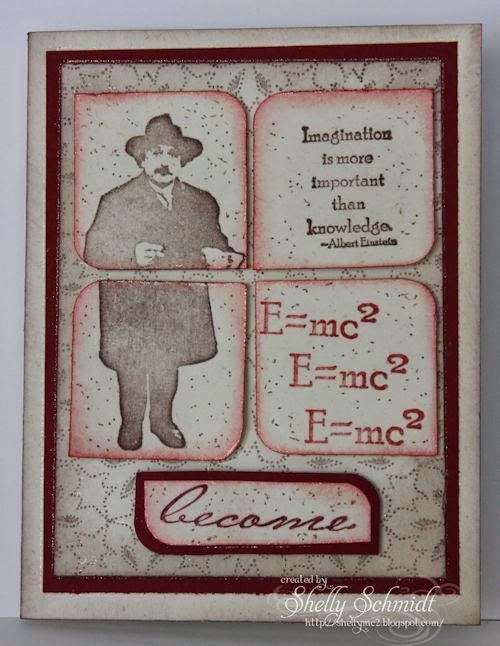 FYI- did you know there is an Einstein Memorial in Washington DC? We had to go visit there when we went to DC. We are using Swirls for our challenge at Sweet Stamps this week. 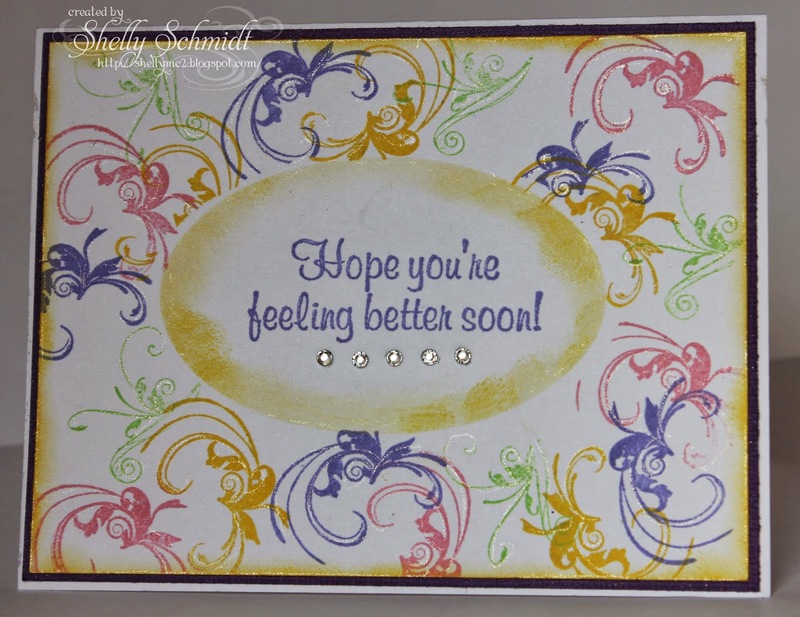 I used the clear acrylic index that comes with the stamp set over the cardstock/Mask for placement and of the swirls. I decided to make a 2nd card using Springy colors. I used just one flourish image from the set this time, and masked the oval like I did for the 1st card. I added shimmer with a Sakura Gelly Roll pen and rhinestones. Here is a direct link to the Monthly Challenge as well- 3/15-4/14-Inking your Stamps with Markers. You have a chance to WIN- winners drawn by Random.org. 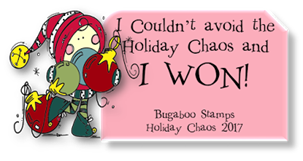 It's Anything Goes for our challenge this week at Sweet Stamps . I made a card for a Nephew that is getting married next weekend. The setting of the wedding is in a church built in 1865 and in a country setting. I thought this would be a fitting image. 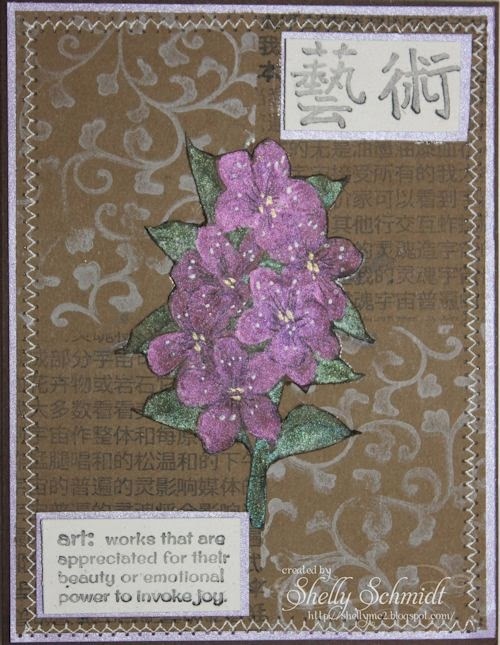 I stamped and embossed the ATC frame, and used the 4-split perforating tool to remove the inner frame and vellum. 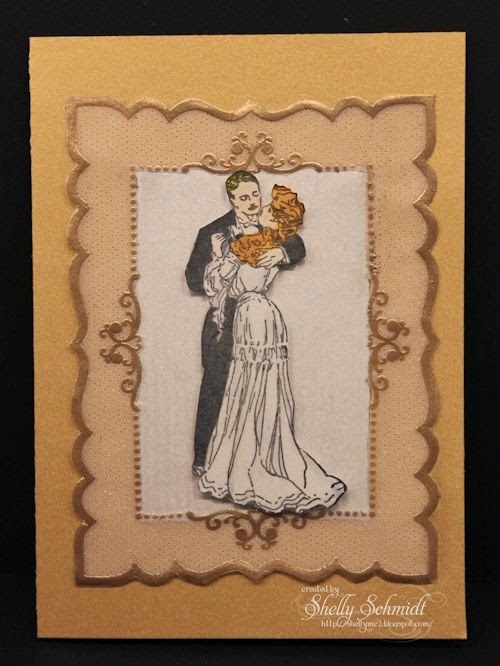 I added some striped white DP from Paper Temptress in the center frame to be the backdrop of the couple. I fussy cut the dancing couple and added a touch of color with Copics and then coated the dress with Fairy Dust Creative Inspirations Paint. 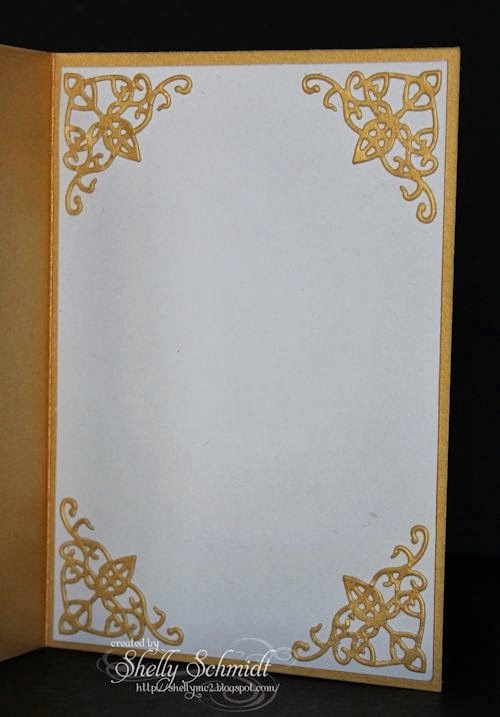 I used a shimmery Gold cardstock from Marco's Paper. Here is a direct link to the Monthly challenge as well- 3/15-4/14-Ink a stamp with Markers. You have a chance to WIN- winners drawn by Random.org.